DIEHARD Holden V8 fans have a reason to cheer, even as they prepare to farewell the homegrown Commodore. The iconic Chevrolet Camaro muscle car will fill the V8 void in Holden showrooms next year, almost five years ahead of schedule — and ahead of the next generation flagship Corvette sports car due in 2020. 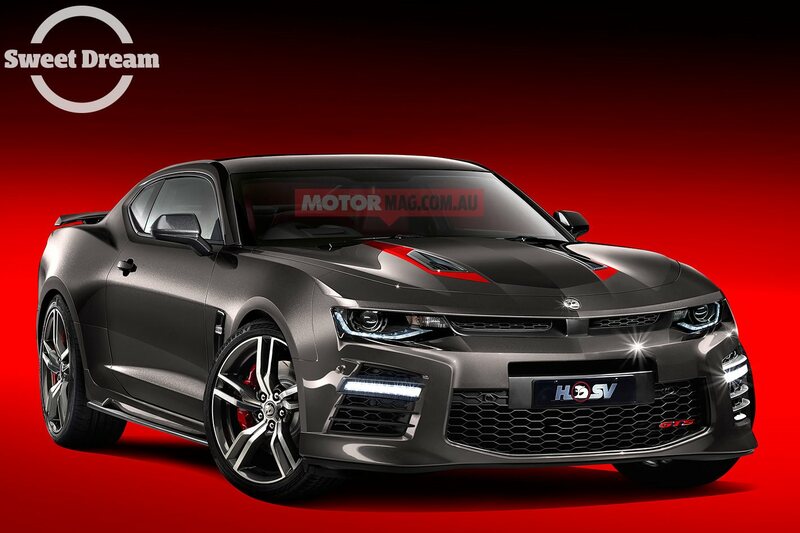 These exclusive photos show Holden is preparing to import the Camaro SS and have it converted to right-hand-drive in Melbourne by its longstanding performance-car partner Holden Special Vehicles. Busted! A Chevrolet Camaro near HSV engineering headquarters in Melbourne, obscuring a bright green HSV GTSR in the background. The two Camaros caught on camera near HSV’s secret engineering centre are yet to be switched to right-hand-drive, but the plans are well progressed, with direct support from Detroit. Holden wasn’t supposed to get the Camaro until the next generation due in 2022, when it will be built in right-hand-drive on the North American production line for the first time. But the runaway success of the Ford Mustang — the Camaro’s arch rival — has seen Holden pull out all stops to get the Chevrolet into local showrooms as soon as possible. And then there were two. Another Chevrolet Camaro near HSV’s engineering base. HSV will also turn its hand to Colorado utes (see background) in 2018. Dodge is also said to be considering building the next generation Charger SRT sedan and Challenger coupe in right-hand-drive from the factory (see breakout). When Ford reintroduced the Mustang in Australia in late 2015 — as a factory-built right-hand-drive for the first time — it conservatively estimated about 1000 sales per year. This year, it is poised to sell almost 10,000 Mustangs, roughly half the total sports car market in Australia. The Camaro will fill a crucial blank in Holden’s line-up when it arrives in selected Holden showrooms mid-2018, about the same time as a facelifted version of the Ford Mustang. When the Commodore V8 goes out of production on October 20, it will be the first time since 1968 Holden does not have a V8 in its line-up. There might not be a Commodore V8 next year, but how about a Chevrolet Camaro? The 2018 Commodore imported from Germany is only available with four-cylinder or V6 power. The imminent arrival of the Camaro means there will only be a six-month gap without a V8. Because the local conversion process adds significant engineering costs to each car — and therefore pushes up the price — Holden does not expect to match the Mustang for sales. Although the Mustang and Camaro compete head-on for price in the US, the Chevrolet is likely to be at least $20,000 dearer than the Ford. Camaro pricing is yet to be confirmed but dealers have been given an indicative cost of between $80,000 and $90,000 on the road — about the same as a HSV Clubsport — with a choice of six-speed manual or eight-speed auto. The Camaro is faster and more powerful than the Mustang but the premium pricing means it won’t come close to Mustang for sales. It will, however, appeal to Commodore V8 fanatics who can’t bring themselves to drive a Ford. The steering wheel will be on the right by the time HSV has finished with it. In the past decade HSV has sold about 3000 V8 sedans per year, most of them priced near where the Camaro’s RRP is expected to land. Local production constraints will likely limit Camaro output to about 1000 vehicles per year. The switch from finessing fast Commodores to converting Camaros will also mean a jobs boost for HSV, with an expected increase in the workforce from 150 to 200 to manage the more labour-intensive work. Unlike other locally converted vehicles, the HSV-built Camaros will be completed to factory quality and safety standards, come with a factory-backed warranty and be sold and serviced at selected Holden dealers. However, the cars will wear Chevrolet badges; the gold “bow tie” emblems won’t be replaced with Holden logos. At this stage there are no plans for HSV to enhance the performance of the Camaro, as it has done for decades with Commodore. Any further modifications would add cost, but there’s also a reluctance to upset the formula that has won the Camaro praise in head-to-head contests with the Mustang in the US. The ’bahn-storming Chevrolet Camaro ZL1 1LE will follow the Camaro SS in the second half of 2018. The Camaro SS — powered by a 6.2-litre V8 borrowed from the latest Corvette — has more power and torque than the Mustang and yet has a lighter body. Its significantly lower roof line also gives Camaro a lower centre of gravity, and US magazines have praised its handling. Those craving even more performance will likely hold out for the Camaro ZL1 1LE — complete with wild race-car-like wings — set to cost in excess of $120,000. It’s due to follow the Camaro SS late next year. Those six digits — ZL1 1LE — may be meaningless to Australians but in the US they’ve become iconic since it became the most powerful Camaro to date, and the fastest to lap Germany’s famed Nurburgring. Here’s further proof the Camaro is coming to Holden showrooms next year. The ZL1 1LE has a supercharged 6.2-litre V8 with an epic 485kW of power and 868Nm of torque — eclipsing the HSV GTSR W1’s output of 484kW and 815Nm, and in a lighter body than the Commodore sedan. The previous generation Camaro very nearly made it into Australian showrooms 10 years ago, but those plans were scrapped once General Motors went bankrupt during the Global Financial Crisis in 2009. The previous Camaro shared its underpinnings with the 2006 VE Commodore and Australia led development of the US Camaro even though it was built in Canada. It was suitable for right-hand-drive given its Commodore genes, but the program was axed once GM went bust. The Chevrolet Camaro SS (pictured) will arrive ahead of the supercharged ZL1 1LE. More good news for Holden diehards: the Chevrolet Silverado pick-up is coming too. The Camaro won’t be the only car wearing a Chevrolet badge in Holden showrooms next year; the Silverado pick-up is heading Down Under, also to be converted to right-hand-drive locally by HSV. The Melbourne outfit has had plenty of practice over the past couple of years converting Dodge Ram pick-ups in a facility not far from the HSV production line. HSV will also be modifying the Holden Colorado ute from the first half of next year. The HSV Colorado will get styling changes, better tyres, suspension and brakes. But power from the 2.8-litre turbo diesel will remain unchanged because the cost to retest emissions and durability is too high. Reports out of the US say the next Dodge Challenger coupe and Charger sedan could be built in right-hand-drive. Australia could get a third American muscle car in a couple of years, with Fiat Chrysler Automobiles looking at producing the next generation of the Dodge Charger and Challenger in right-hand drive. The next generation was originally due in 2018 but according to US media reports the launch has been moved back to 2020 or 2021. Fiat-Chrysler is reportedly looking at a major update to the current cars in 2019, before developing all-new models based on the same underpinnings as either Alfa’s Romeo’s Giulia or Maserati’s Ghibli. Fiat-Chrysler Australia won’t comment on the plans, other than to confirm it has “a live business case” lodged with the US for the next generation cars. Where are the No options in your poll monstar ? Or is that not PC enough ? commodore665 and Nitro_X like this. CalaisNQ and lmoengnr like this. I don't mind it, but I won't be trading the Redline on one any time soon. Hardly a replacement for the VF at that price. HSV buyers only need apply. ugh Silverado - Camaro though, giddity! I'll take a Silverado. Camaro will hopefully shut some of the sooks up about Holden not offering a V8. But I would like a 4door muscle V8. Silverado is a "pickup truck", not a ute. Emphasis on truck. lmoengnr and Nitro_X like this. I think that the Camaro was inevitable, but how successful it will be on the sales chart is debateable. Price ? Practicality ? Looks ? There are customers who can afford it, don't care about how useful it is, and like how it looks. I think GM/Holden/HSV have missed the boat. The number of V8 Mustangs available on Carsales indicates that they were either bought as an 'profiteering investment' which has backfired on the greedy buggers, or they would be useful as an everyday car carrying passengers to and from the shops. So maybe the curiosity of V8 RWD coupes has been mainly satisfied.? I keep thinking of history repeating itself. For both dynasties of Monaros, they sold in reasonable numbers in year one then sales gradually fell away. Same for the old Falcon Hardtops. Aussies don't buy lots of large two doors and I think it will happen again. I keep thinking of history repeating itself. For both dynasties of Monaros, they sold in reasonable numbers in year one then sales gradually fell away. Same for the old Falcon Hardtops. Marc 1964 and VS_Pete like this. ...but it's not a Holden. It's an American import. It will be sold in Holden showrooms. Therefore, Holden will be offering it for sale. Apart from the commodore, there all imports. Any way most of commodore parts of late, are imported, and just assembled into a car here.